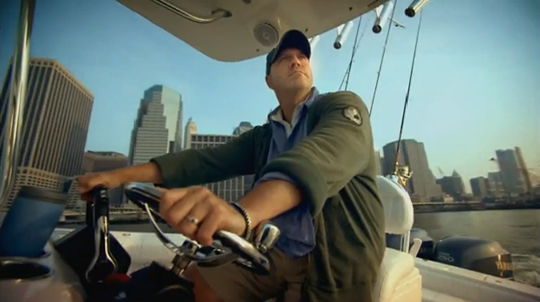 As a followup to his Diet Coke commercial, Tom Colicchio is in a commercial for American Express promoting the small businesses Urban Angler with beautiful shots of him, on a boat in Lower Manhattan, fly fishing. Captain Colicchio! "The great thing about fly-fishing: When you're out there on the water, everything melts away... Between running restaurants, writing cookbooks, and doing TV, I need that getaway," he says. 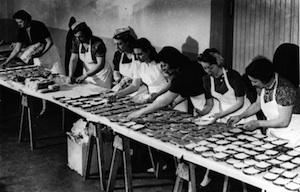 We were wondering: is it safe to eat fish out of the East River? According to the New York State Department of Health's "2009-2010 Health Advisories on Eating Sportfish" (pdf) pamphlet, it surprisingly is, but with certain limits because of contaminants in the water: "You should eat no more than one half-pound meal of fish per week from any of the state’s fresh waters," they say, with specific warnings for pregnant women and children under the age of fifteen. Fish to avoid are American eel, Gizzard shad, or Hepatopancreas ("the green stuff") of lobster and crab. Oysters and clams are definitely off-limits. Still a little scary, but there you go. Tom Colicchio truly is the most interesting man in the world. One of the owners of Urban Angler is Andy Madoff, Bernie's son. Don't know if he's one of the helpful, friendly clerks in the ad. So, Jamitup, he doesn't always drink beer but when he does it is always Dos Equis? I think Tom C. is the sexiest man alive.